Metro Board Member Ara Najarian’s seat at the table of the Metro Board of Directors is in danger because of his staunch opposition to the I-710 Big Dig project that would tunnel under San Gabriel Valley cities to connect the I-710 and I-210. Najarian, a Glendale City Council Member, serves on the Board as a representative of 12 “North County” cities including Glendale, Burbank, La Canada, San Fernando, Malibu, Calabasas, Agoura Hills, Hidden Hills, Santa Clarita, Lancaster, and Palmdale. While these cities still support Najarian’s re-nomination as a Board Member, the Board Members are officially selected by The City Selection Committee (CSC). A CSC committee rejected his nomination, last week, with members specifically citing his opposition to a project that is nationally ridiculed by environmentalists and abhorred by the communities it would negatively impact. “As a resident of one of the North County Cities, La Canada, that unanimously supported Ara as its representative on the Metro Board, I and many others are outraged that our cities’ selection for this position is being undermined,” writes Jan SooHoo, a leading member of the No 710 Coalition. 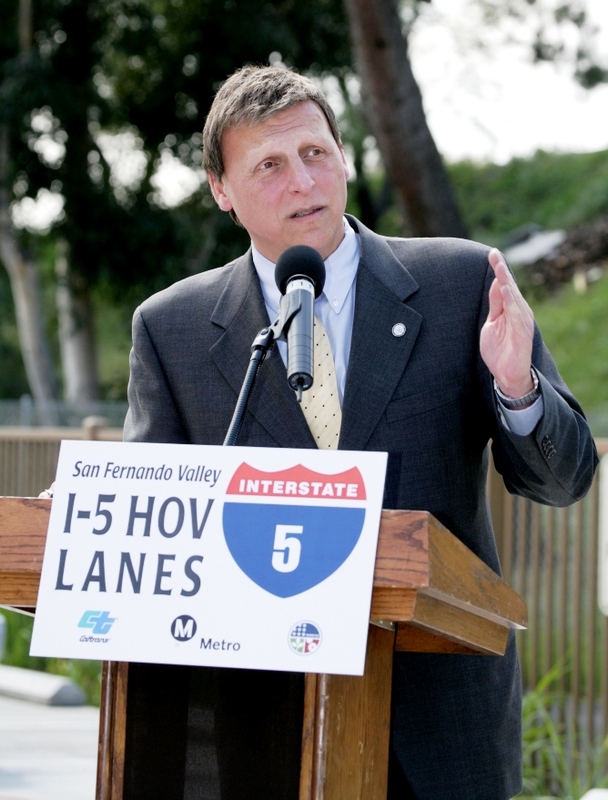 Alhambra Mayor Barbara Messina agreed that Najarian’s stance and tactics on the long fought-over freeway are “not right,” and that he should no longer be on the Metro board. In essence, both Fasana and Messina are complaining that Najarian is representing the wishes of his constituency too well and are doing their best to blunt that advocacy. Being on the Metro Board of Directors is not for the faint of heart. For Najarian’s part, he is not done fighting. His appointment officially ends in January, but he would not formally be replaced until after a replacement is found and approved. In a statement released by the City of Glendale, he vowed to fight to overturn the committee’s political decision by being re-nominated by his caucus and taking the fight back to the next meeting of the CSC. At the last meeting, Najarian netted a vote of the majority of members, but he need a vote of members representing a majority of the member cities. The frustrating part of this whole thing is that board members are also part of other groups that appoint other board members. They shouldn’t be allowed to use other positions to deny (or even support) the appointment of fellow board members. Everything about the process is just so convoluted. Ara Najarian represents the constituency that opposes the tunnel. He is promoting healthy public debate and he imparts accurate information about the toll tunnel project which would be a disaster for Pasadena, So. Pasadena and El Sereno. Just because Messina and Fasana disagree with him, does not mean he should be kicked off the Metro Board. We need transparency in this project, not subterfuge from the San Gabriel faction. who think the Metro F-7 tunnel proposal is a very bad idea. Disagreement with other Metro board members should not be grounds for losing a Metro seat. Shame on Messina and Fasana. Hopefully the City of South Pasadena will withdraw from the San Gabriel Valley COG and join Najarian’s, which is much friendlier and has infinitely better representation! Ara Najarian is the mouthpiece of the cities he represents on the Board. give us a voice. I’m behind Ara Najarian 100 percent. Thank you, Ara, for being there for us. Well it is a holdover from the way the old LA County Transportation Commission was selected. People look at Metro as if it were a transit operator. Really, that’s not its core function. The real purpose of Metro is to act as the funder and planner for all those transit and highway projects. Although Art Leahy has refocused the agency on operating transit, before most of the CEOs were planning and construction types. All of these transportation commissions have convoluted boards. San Bernardino County has representatives from every city in the county, and so does Riverside – that’s a three hour drive from Needles or Blythe into a commission meeting. I was talking to Dana Gabbard this weekend about how governance matters. Most people don’t understand it, as it is a graduate poli sci type topic, but how boards are appointed or elected, at large or by district, how the districts are selected, and what their constituencies are is important in understanding how government operates. Basically I think there are board members who are frustrated with Najarian’s stance, and his unlimited bully pulpit on the board. They want to relegate him to the 60 seconds of hate that other public officials get when they speak up during public comment. The problem is that governance is messy. If you wanted to take Najarian out of office, the best way to do it is to contribute to his opponents for the April 2013 Glendale election. The problem is that the freeway-industrial complex’s hands would be all over it, as random people suddenly have thousands of independent expenditures made in their name. I am one of the few people here who support a project on the 710 (congestion priced, truck free tunnel, two or three lanes in each direction only, toll revenue sharing to the communities impacted), but you have to let Najarian speak his mind. Otherwise it looks even worse when this project hits the inevitable lawsuit. It is offensive that Ara Najarian is being persecuted for doing due diligence regarding a multi billion, community destroying project such as this tunnel/tollway. Since when are officials not allowed to ask questions and voice their opinions in the United States? Last time I checked it was one of the freedoms we are so proud to have. Isn’t what Mr. Najarian is doing exactly what he was elected to do, to represent the people and ensure that our communities are the best they can be? It’s ironic that his loudest detractors (Messina and Fasana) are the very people who should be monitoring their own questionable ethics rather than trying to silence anyone who has opinions contrary to their own. Who will Barbara Messina try to take down next? Anthony Portantino (yes, I do realize he just left office), Adam Schiff, Carol Liu or one of the other elected officials that have also vocally objected to the folly that is the 710 tunnel and demanded answers to the same questions that Najarian has posed to Metro? This is just one more example of unethical behavior from someone who is unable to demonstrate the kind of leadership and character that Najarian has. Maybe Messina would try to go after Mayor Bogaard of Pasadena next. I’d like to see that match-up!!! As Calwatch notes, how Boards are structured matters as to how policy plays out. When “Brian I” last month on The Source declared “There has to be a point where Metro has to step its foot down and say ‘we’re going full TAP starting tomorrow, and that’s FINAL. Everybody else that’s not on TAP but has agreements, that’s your problem to solve on your own. '” I responded by noting a close look at the composition of Metro’s Board would make one realize why unilateral action on the part of Metro isn’t in the cards. Since it is likely in the end Najarian will get re-nominated by the Sector Subcommittee I have to wonder if this is all so Fasana etc. can claim to the pro 710 folks “we put up the good fight” when folks grumble about Najarian having a bully pulpit. The politics of the San Gabriel Valley can be quite complex. Making questions is good. You know what’s better? Finding the answers. Metro is obligated to do so during the environmental review. Yet, if there are answers that are within the realm of reality, can make both sides happy and are STILL rejected, well, how much mercy can one show to opponents who are beyond reason and collaboration, when they do not show mercy to those who actually use the 101 and the 5 Freeways every day? That said, it would be a terrible thing for the Metro Board to dispense with Mr. Najarian because of his opposition to the 710 Freeway Tunnel, even though I don’t agree with him on this one point. He has provided valuable support for both transit and highway projects in the past. If anything, Najarian also provides a check towards the tunnel project, so that said project can be better designed and more viable. That actually would have made sense if we were talking about a surface freeway. Since the proposed route closely follows the LA-Alhambra city line, one could’ve built it (almost) entirely within Alhambra. But since we are talking about a tunnel, which affects nothing on the surface, the point is moot. The gap needs to be closed! If the other cities who have the right to vote on this issue chooses to get rid of Najarian, so be it. Which is exactly why, Dana, the T.A.P. program should not have ever been administered by LA Metro. However, the City of Alhambra has to put up with a lot of the traffic due the 710/210 gap. The City of Alhambra has every right to voice its opinion to complete the gap. To add to wqjackson’s point, like I said, the 101 and 5 Freeways have traffic that should be on a completed 710/210… traffic that shouldn’t have been on the 101 and the 5 in the first place. Other than the residents / retailers / companies / etc. that are in the 710 routing way, No cities, no body should have the right to oppose the 710 gap because this was ot only planned but approved way way back in the late ’60’s early ’70’s. In fact to the best of my knowledge, the 210 fwy was built to boost real estate sales in La Canada / Flintridge, La Cresenta, Tujunga, Sunland, Kagel Cyn., and Lake View Terrace. Back then these cities was considered the Palmdale/Lancaster of today. Also none of thses cities opposed this back then. Also not to change the subject, but why does the city of Burbank need to stick there two cents in this for. Burbank opposes this gap also, however traffic on the 5 would decrease a little if the gap was finished. Here we go again comments not based on facts. La Canada Flintridge was not a city at the time (represented by co supervisor) the 210 was proposed going through and it certainly wasn’t built to boost real estate sales when, in fact, it does the opposite. The community opposed it, but it was foisted on them anyway, because they were not an incorporated city. One has to wonder where Johnny lives and if he would opposed a freeway going next to his house. Los Angeles, La Canada Flintridge, South Pasadena, Pasadena all have given up homes, businesses, quality of life for freeways built years ago. One or more freeways is enough for any city and they have the right to say no. I think it’s time for San Marino, which does not have a freeway, to step up and take one for the region and ask for the 710 toll tunnels to go under their city since they are in favor. Metro CEO says you can tunnel anywhere, so how about it San Marino?